Sir Paul McCartney singing Smells Like Teen Spirit! 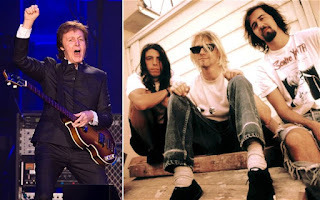 Brace yourself – Sir Paul is filling in for iconic front man Kurt Cobain in tonight’s much anticipated 12-12-12 Hurricane Sandy relief concert. Apparently, they will not be playing Nirvana classics like Smells Like Teen Spirit or Lithium. Instead, they will play a new song. The show will be streamed live from Madison Square Garden. Performers include the Rolling Stones, Bruce Springsteen, The Who, Chris Martin, Paul McCartney, Kanye West, Bon Jovi, Eric Clapton, Alicia Keys, Billy Joel and Roger Waters.